Mind Pirates! Make Them Walk the Plank! Thoughts that hijack your day and contribute to feelings of stress and un-ease, are what my kids, my students and I call Mind Pirates. Some days there are many mind pirates setting sail on the seas of our mind, making stormy and uncomfortable feelings as a result. Mind pirates are synonymous with negative thought patterns. Our thoughts directly influence how we feel. When you or your child is feeling stressed, it helps to pause for a moment to take inventory of the thoughts that are whirling around in your mind. Stressful feelings come from stressful thoughts. So if we want to feel peaceful, then we have to think peacefully. 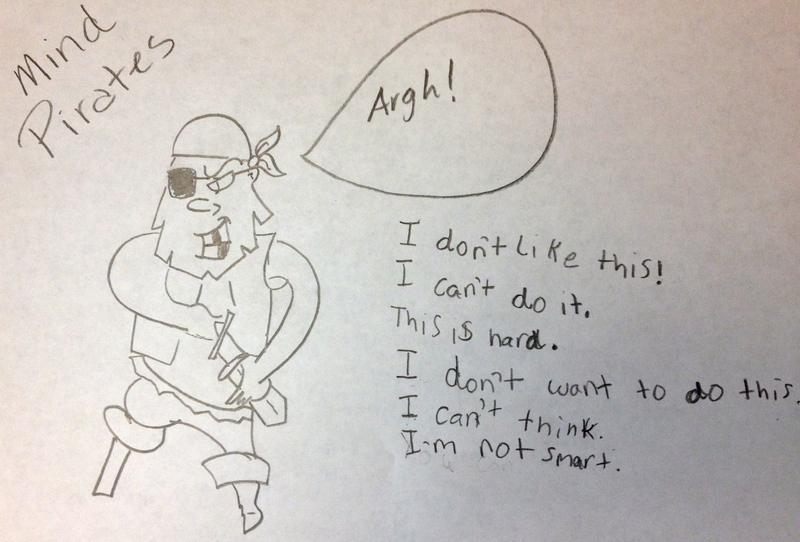 I have been working on mind pirates in the school setting, however you can apply this to home as well. Quiet your mind by closing your eyes and taking two long, slow deep breaths. Next, think about a time you were struggling in the classroom, when you were not feeling good about your schoolwork. Tell me about it. What was going on around you? (Pause) What were you thinking in that moment? What thoughts bother you in class? What thoughts steal your attention away from your work? Those are your mind pirate thoughts. Write down those thoughts next to the pirate on the paper. Focus on the thoughts you wrote down and turn them around to be treasure thoughts. Treasure thoughts are thoughts that help you learn, and help you to feel good about yourself as a student. You have the power to make mind pirates walk the plank as you transform them into treasure thoughts. 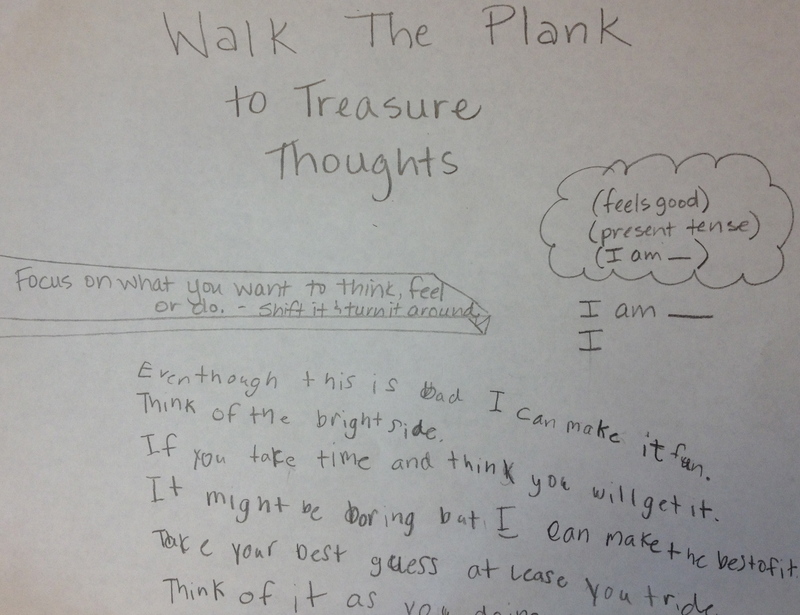 For example, the mind pirate “I can’t do this, it is too hard,” can walk the plank and turn into “Even though this is hard, I try my best and take my time.” Think about what you want to think, feel or do in the classroom and write it down next to the plank. Spend some time writing treasure thoughts for the classroom. Focus on what you do well, what you are good at, what is easy for you. The more treasure thoughts you think, the better you feel and the more ready you are for learning. To keep those treasure thoughts going and to enhance feelings of relaxation in the classroom, finish this work by practicing a relaxation technique. 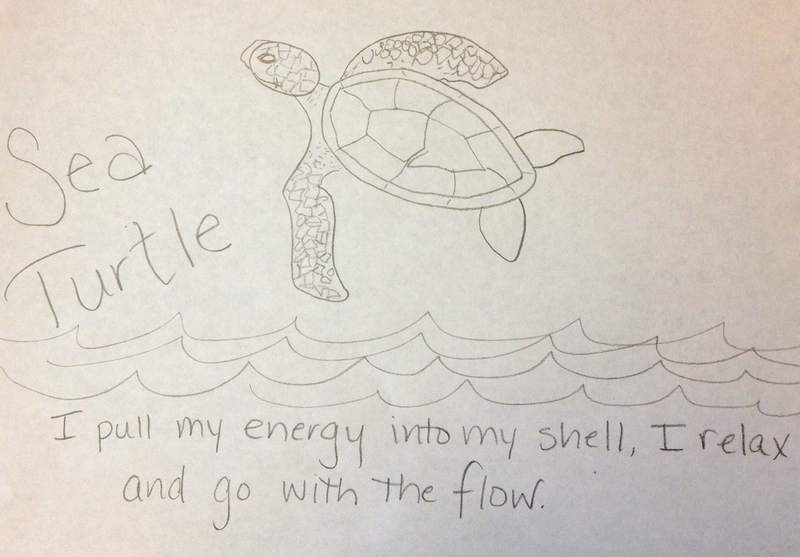 We chose the sea turtle, http://wp.me/p11MDD-8K, but you can supplement with any that fits your child and/or your classroom. One Response to Mind Pirates! Make Them Walk the Plank! This is a great idea! Thank you for your creativity!